After making a batch of stuffed mushrooms, there was a healthy portion of stuffing left over. A pork loin roast in the fridge lay waiting. Serendipity. The recipe that follows assumes you will not be making a batch of stuffed mushrooms first. But please feel free to do so. Pulse mushrooms in food processor until finely diced. Mix mushrooms, bacon, sausage, crumbs, and egg until well mixed. Slice pork roast length-wise, to approximately half way through. Open the roast and then beginning at the cut, slice to the left to 1 inch from the outside and repeat again to the right. If you were to roll the roast back together, the cut would make a an inverted “Y”. Spoon stuffing evenly along center of the roast. Bring the sides back up around the stuffing and tie with butcher twine every inch. Rub spices liberally on roast. We utilized a blend of celery seed, salt, pepper, toasted onion powder and shallot powder but a Bloody Mary spice mix would work well. Wrap the roast in plastic wrap. Refrigerate overnight. Heat oven to 475 degrees. Unwrap roast and place in roast pan. Cook at 475 degrees for 10 minutes, then reduce heat to 300 degrees. Cook for 90 minutes, or until it reaches an internal temperature of 150 degrees. Remove from the oven and let rest 5 minutes before slicing and serving with roast potatoes or side of your choice. Nordic cuisine has ascended in recent years to join the culinary pantheon of fine dining, a welcome broadening of the traditional European references for modern American experimentation. Such a re-emergence of Nordic influences generates an interesting confluence in the Midwest, particularly in Wisconsin and Minnesota, where immigrants settled a few generations ago. 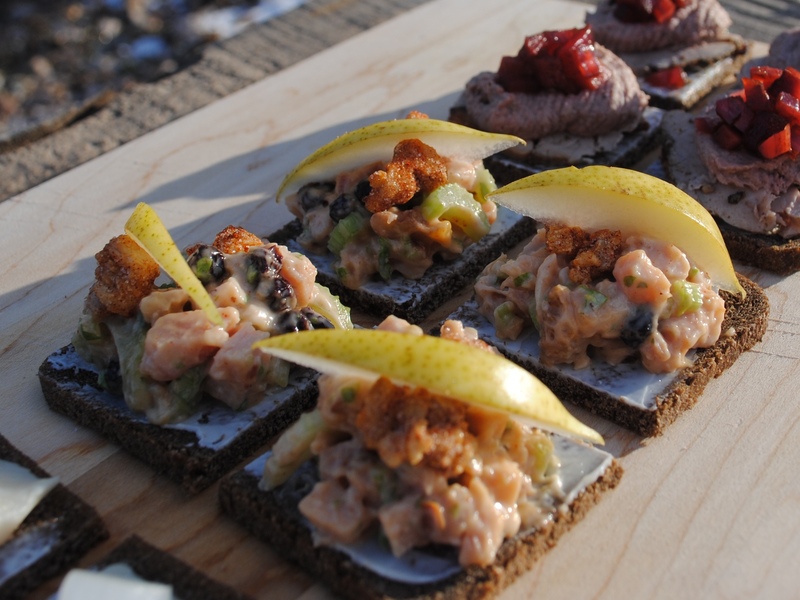 They brought with them a great number of culinary traditions, including the open faced sandwich – smørrebrød. In the simplest form, this is a specific style of rye bread, spread with butter, and topped with meats and accompaniments, eaten with a fork and knife. These sandwiches were a traditional lunch offering, and the butter was intended to keep the bread from getting soggy under the toppings. The name literally means “butter bread” in Danish. 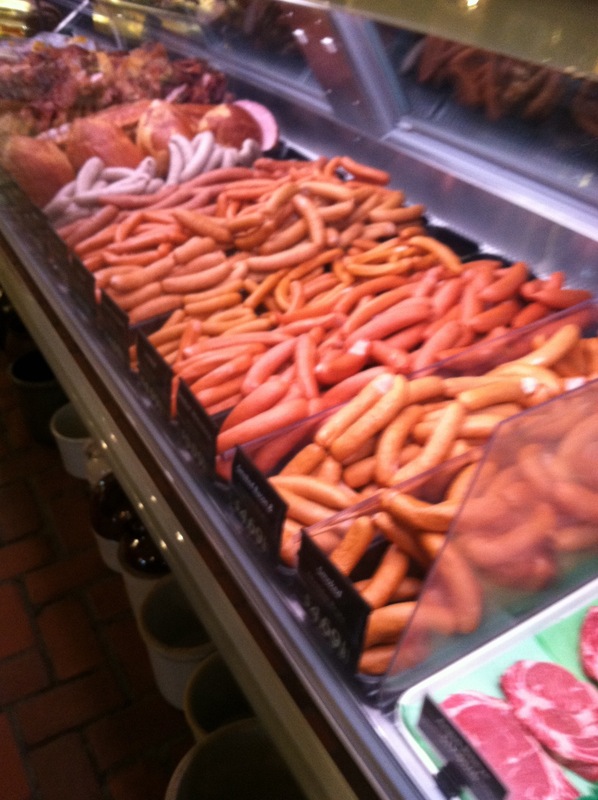 If you want a more in-depth description of the current Danish traditions, the blog – danishsandwich.com goes into the more formal service traditions as well as the line-up of sandwiches that have become somewhat standardized in Denmark. We would rather refer you to a passionate expert, than try to do justice to the tradition in this short piece. 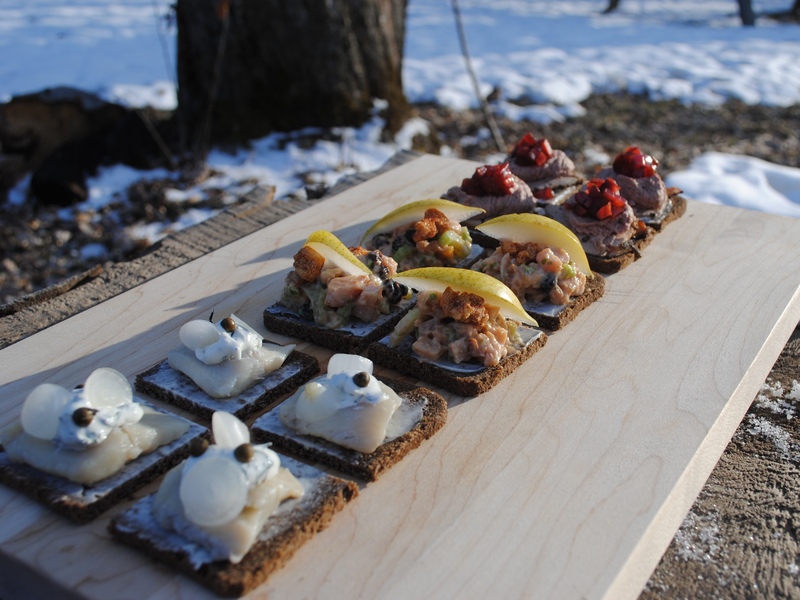 And while we’re referring to experts, we’d also recommend the blog and cookbook from Brett Laidlaw, Trout Caviar, which is where we started our more in-depth reading on these Danish open-faced sandwiches. He views them as a canvas for expression of his love of local ingredients and local traditions. Throughout both his cookbook and his blog, he captures much of what we consider Great Lakes Cuisine. 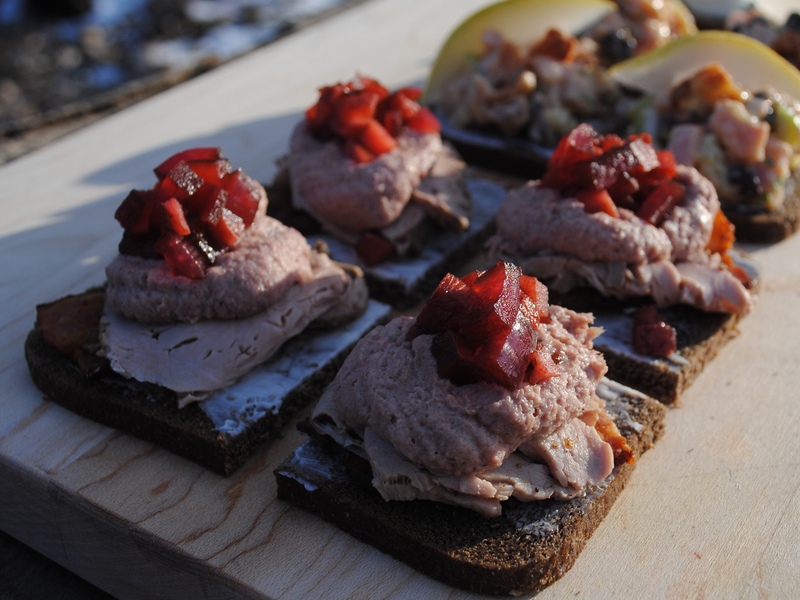 The particular local love we wanted to express on our version of smørrebrød was for smoked meats. We have explored the smoked meat topic before, but we made a recent pilgrimage to Wittenberg, WI to the temple of all that is smokey, meaty goodness – Nueske’s. We took great liberties with the traditional preparations, but stuck to the rye bread, butter starting point. It may not be apparent in the pictures, but we actually quartered the slice of bread, so each open-faced sandwich actually became a two-bite appetizer. 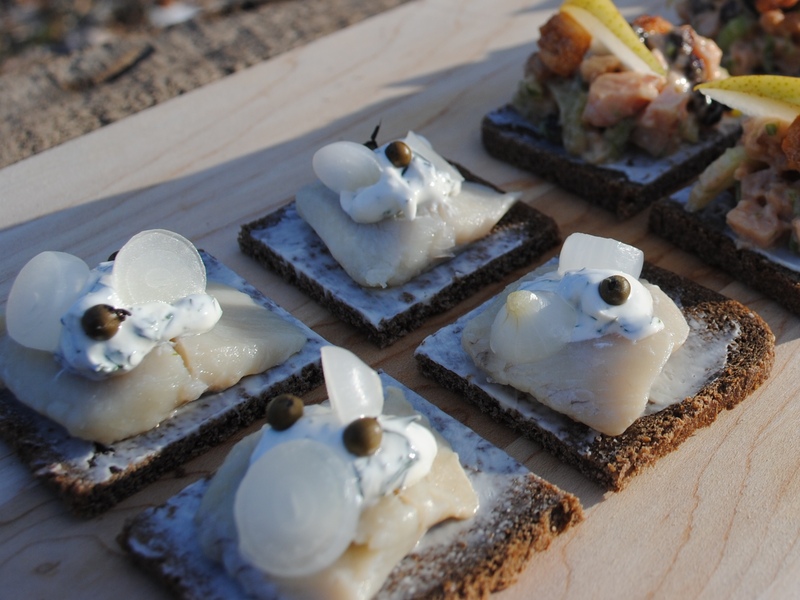 Herring is traditionally the first served and we honored that with our offering here. The pickled herring is prepared by Bay View Packing Company in Milwaukee, WI. They use imported Atlantic herring, which is not related to the lake herring of Lake Superior (Dara Moskowitz Grumdahl from Minnesota Monthly details the differences here with great piece of culinary history). We topped each piece with a dill cream, pickled onions and pickled green peppercorns (in place of the more traditional capers). A fresh sprig of dill would have been a nice addition. Our smoked chicken was diced fine and prepared as a chicken salad with plumped currants, celery, and candied, spiced walnuts. We used a malt vinegar mayonnaise which took on the smoky flavors of the chicken when the flavors were allowed to meld overnight. Topped with a slice of pear and additional candied, spiced walnuts, this was a sweet and tangy, smokey and rich bite. Our final sandwich was Three Little Pigs – a smoked pork liver mousse on roast pork loin blanketing a piece of smoked, thick-cut bacon. The inspiration for the mousse was actually two different sources. We had a version of Fedt (Danish for “fat”) based on the recipe at danishsandwich.com which came out wonderfully using the Nueske’s bacon drippings, apples, and onion caramelized together, then pureed. Discovery of a recipe from Amy Thielen’s cookbook, The New Midwestern Table, for braunschweiger mousse was another inspiration. She uses mascarpone cheese whipped into braunschweiger to add richness and and a velvety texture. So of course we whipped our fedt into our smoked liver pate. This, my friends, was goodness. The topping is finely diced, house-pickled red onions and watermelon radish. And our happiness was complete. Find your happiness, express it through food. Traditional and new. Simple and complete. This is Great Lakes Cuisine. A recent gift of spicy venison sausage came with a warning – don’t over cook or it will dry out. This is pretty standard fair for any cut of venison, but often the pork fat added to sausages provide all the moisture needed. But these were not natural casings, and the links were not sealed as tightly as we might have preferred. 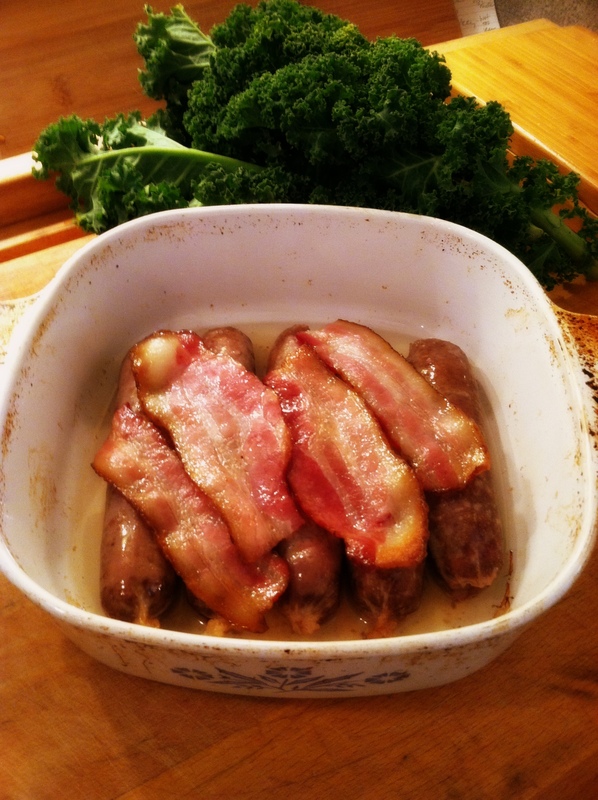 No problem – we baked them under a blanket of Nueske’s bacon to ensure moist, flavorful sausages. Heat oven to 300 degrees. Slice two pears vertically into 1/4 inch slices. Heat 1 cup water with 1 cup sugar to a low boil with 3 bay leaves, 5 cloves, and a cinnamon stick. 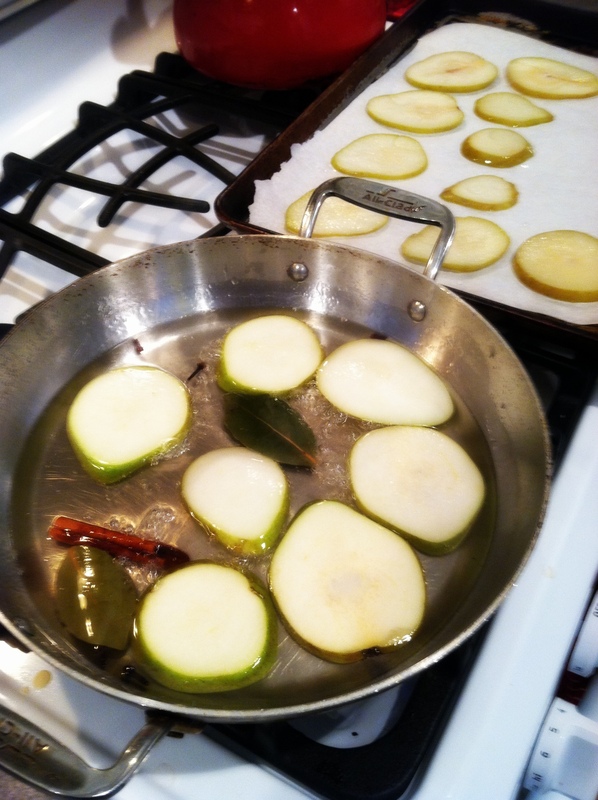 Add pear to the pan and allow to boil until beginning to become translucent. Place on a baking sheet lined with parchment paper. Place in oven until just beginning to turn caramel brown, about 20 minutes depending on thickness of the slices. Allow to cool and then cut into 1/2 inch squares for this recipe. Also, these can be left whole as a snack. The poaching liquid cooled becomes a wonderful simple syrup for cocktails. In this dish, the spicy venison sausage are baked then allowed to cool enough to slice. These are added to a skillet on medium-high heat with rendered bacon fat. The roasted sweet potatoes are added along with kale, which is allowed to wilt. Pre-cooked quinoa is added to the skillet along with the candied pear pieces. The dish is topped with large shavings of Asiago cheese. The result is a very pleasant blend of spicy, sweet, and nutty flavors. 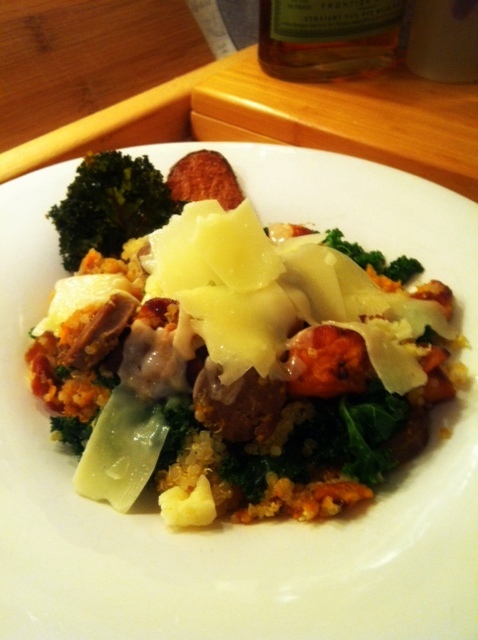 The Asiago adds both nuttiness and creaminess as it melts into the hot dish. The candied pear is not individually discernible, but adds a lovely sweetness to the background and plays off the creaminess of the cheese. We’ve added an additional pear chip and a dried kale chip as garnish. Flavorful, complex, complete. Let’s start with this admission – L’Etoile is one of my all-time favorite restaurants. Over the last 25 years, L’Etoile in Madison and Sanford in Milwaukee have defined the best of dining in the state of Wisconsin. In 2005, Tory Miller moved from chef de cuisine to owner of L’Etoile and has wonderfully nurtured the concept Odessa Piper first opened in 1976. Neither Sanford nor L’Etoile fits the working definition of Great Lakes Cuisine we subscribe to here, but they are both fantastic examples of the best of cuisine, and just happen to be located in the Great Lakes region. L’Etoile, by name and by execution, is French inspired. It is the very best of the French tradition of connection to the farmers, attention to detail, and coaxing out the best flavors possible from every ingredient. The rolls are wonderful, the butter somehow more buttery. And it is amazing what they can do to vegetable. The reason L’Etoile is relevant has to do with the “companion” restaurant for Tory Miller, Graze. They attribute the inspiration for the concept to the “New York gastropub scene”, the effort to serve pub fair at a higher culinary level, but they also directly reference the inspiration from local products, the local farmers, and the local food traditions. And the most intriguing part is the collaborative dinners with local craft brewers, upcoming dinners feature pairings with Hinterland and Rush River Brewing Co. They describe their menu this way: “Our eclectic menus allow you to taste the local terroir through farming practices that embrace the land where food is grown or raised: grass-fed beef, acorn and whey fed hogs, artesian trout, cave aged cheeses, and an amazing variety of vegetables grown in Wisconsin’s most fertile soils.” A number of local traditions find their way on to the menu from Friday Fish Fry to Fried Cheese Curds. The menu promises to be eclectic, so you may also their version of Bibimbap on the menu or Korean BBQ. These would be less traditional and more reflective of the owners’ wide ranging experiences. Nevertheless, the beer dinners trump all and warrant inclusion in our list of Great Lakes Cuisine. 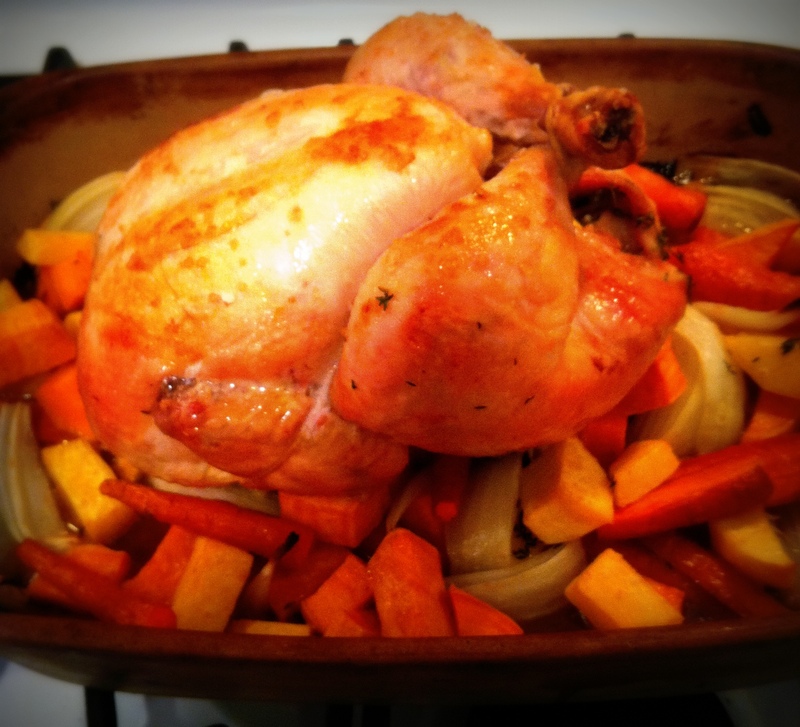 A roast herb chicken over a pan of onions, carrots, and rutabaga – Saturday evening meal. The drippings, after a quick coating over the vegetables, are strained off and refrigerated. 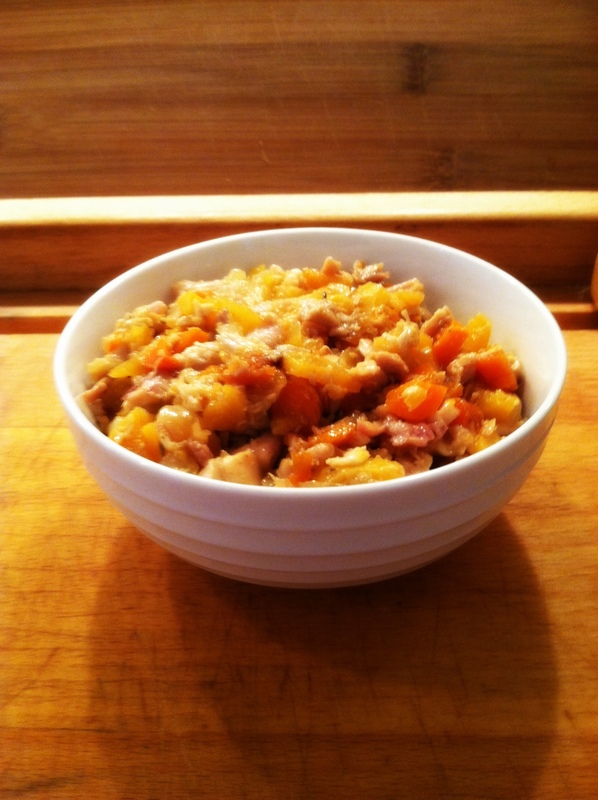 The caramelized bits are scrapped up and added to leftover vegetables and chicken, which has been finely diced. And now the heart of the hand pie. The meat-filled hand pie is known in the upper peninsula of Michigan as a pastie (pronounced either pah-stee or pay-stee). An immigrant dish from the United Kingdom. Lake Superior and Lake Michigan surround this strip of Michigan, a region rich in earthbound natural resources. The iron-rich veins of the hills drew miners from around the world; in particular the mining experts from the Cornwall region of the United Kingdom, who immigrated to the area as their own tin and copper mines began to wane in the mid-19th century. As we witness so often with any immigration, culinary traditions travel well. The pastie was the miner’s lunch, baked into a pie-like crust, which was intended to keep warm the diced mixture of beef, potato, onion, and rutabaga inside (traditional recipe here). The Cornish pastie has actually been recognized by the European Union as a Protected Geographical Indication. 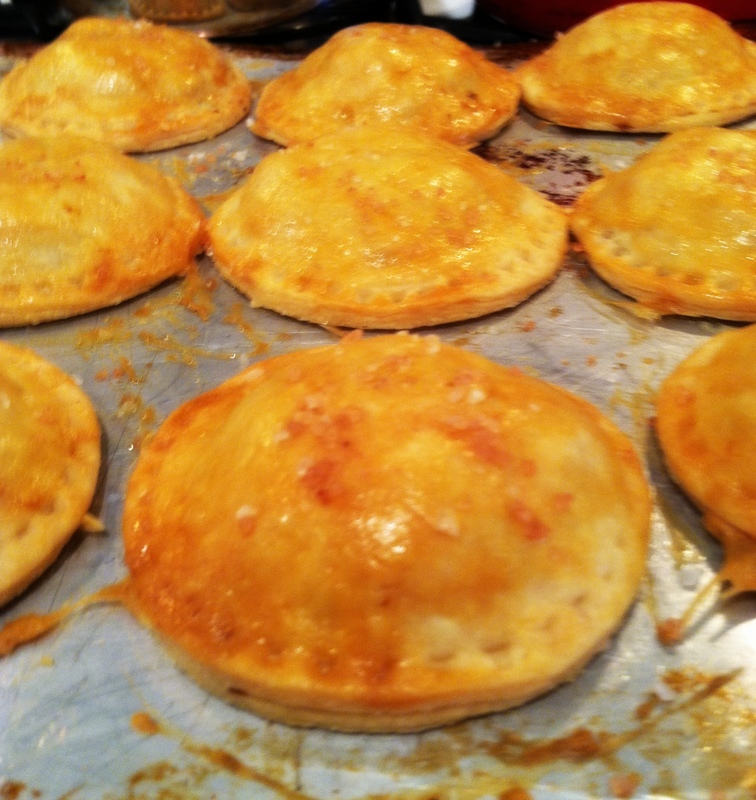 Unfortunately, the hand pies have become somewhat standardized as beef, potato, onion, and rutabaga. And in most cases the ingredients have been cooked separately and then diced and combined. Too often, the result is an overly large, doughy mix of bland vegetables overpowered by pepper. Nevertheless, they can be fantastic after a cold day out fishing or the morning after a particularly long evening of drinking. But returning to the roots of the dish suggest that the filling was the previous evenings left-overs, prepared to retain heat through mid-day. So why not many types of leftovers? 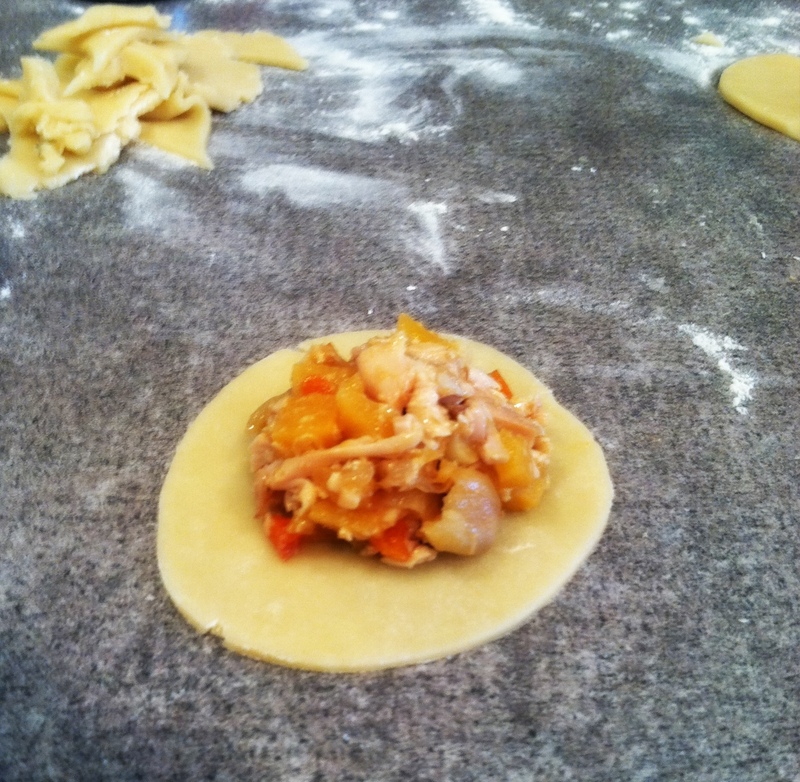 And that inspired our dish here – Roast Chicken with Carrots and Rutabaga Hand Pies. The dough is a traditional pie crust with one substitution – a 1/2 cup of butter was replaced with a 1/2 cup of the cold chicken fat saved from the roasting pan. The congealed jus was added to the filling. The result was an exceptionally flaky crust and flavorful filling. A simple buttermilk gravy was served alongside. Beef Pot Roast with Potatoes and Carrots – Potatoes and carrots cooked with the pot roast, rather than cooked separately. A horseradish dipping sauce. Sauerbraten with Rotkohl – Marinated beef with traditional sweet/sour red cabbage, perhaps a black rye dough. Beef Wellington – A hand-held version of the classic English beef with mushrooms. 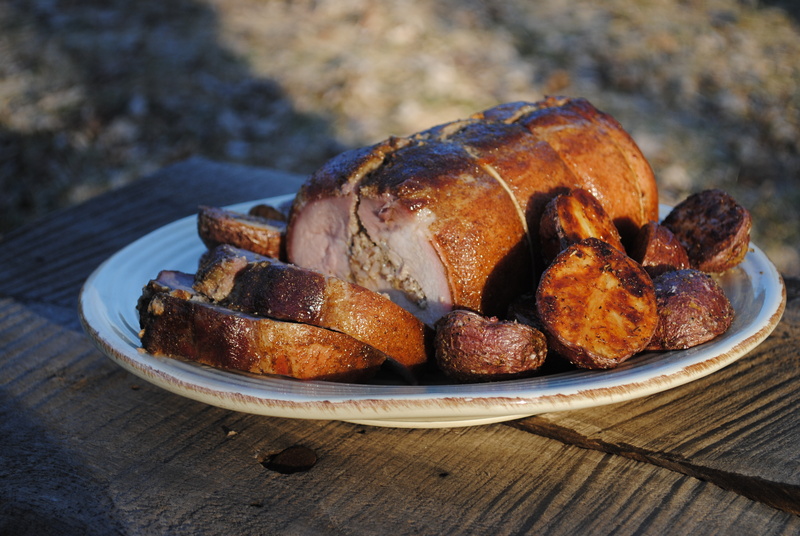 Porker – Brined and grilled pork loin, rough-chopped liver pâté, thick-cut bacon in a rye flour dough. Mushroom dipping sauce.